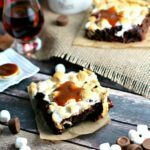 Cognac Brownies are aromatic with vanilla and smoke notes, stuffed with caramels and topped with a homemade caramel sauce. Preheat oven to 350 degrees F. Grease an 8x8 baking pan with 1 tbsp. of butter. In the bowl of an electric mixer, whisk together melted butter and sugar until smooth, add the cognac and continue whisking on medium. Whisk in each egg one at a time on low speed and whisk until well combined. Using a large rubber spatula, gently stir in flour, cocoa, baking soda and salt. Fold in Rollo chocolate caramels. Spread batter into the baking dish and bake for 25-30 minutes until set. 15 minutes into baking, remove dish from the oven and top with mini marshmallows, continue to bake until batter is settled. In the meantime work on the caramel sauce.